Miitomo’s latest collaboration is with none other than Super Mario. There are a lot of activities going on relating to T-shirts, including a Twitter vote and much more. Starting 7/22/2016, vote for your favorite design via our Twitter poll, and the winning tee will be available via My Nintendo! The voting period ends 7/25/2016 at 7:00 p.m. PT. The results of the poll will be revealed in a Tweet. Follow our official Twitter account @NintendoAmerica to stay updated! The winning Miitomo in-app T-shirt will be available as a My Nintendo reward starting 7/28/2016 at 7 p.m. PT. This was a global campaign, so the Miitomo in-app T-shirt you can get for free depends on the country setting of your Nintendo Account, as results may differ by region. Launch Miitomo, select “Menu,” and then “My Nintendo Rewards.” The in-app T-shirt reward will be available on the Rewards tab for 0 Platinum Points. Create a Nintendo Account at https://accounts.nintendo.com. Once your Nintendo Account is linked to Miitomo, from within Miitomo select “Menu,” then “My Nintendo Rewards.” The in-app T-shirt reward will be available on the Rewards tab for 0 Platinum Points. The rest of the Miitomo Summer T-shirt Fest starts on 7/28/2016 at 7:00 pm. PT! • Free Miitomo in-app T-shirt via My Nintendo! 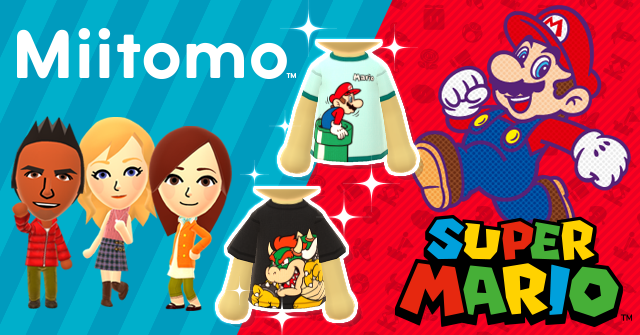 Users with a Nintendo Account linked to Miitomo can get a Super Mario All-Stars tee featuring an array of familiar characters for 0 Platinum Points! • New Miitomo in-app T-shirts available as My Nintendo rewards! Platinum Points can now be redeemed for a Super Star tee, a Super Mushroom tee, and a Fire Flower tee! • A new lineup of original Miitomo T-shirts featuring some familiar characters have been added to new Miitomo Drop stages! You can select Miitomo Drop stages from the Shop tab and then use Miitomo coins or game tickets to play.